These words resonate so much with me right now with everything that I am going through. This life can feel like SUCH a crazy trip sometimes and I find myself just utterly bewildered by the whole thing. Of course, on some level I can recognize the divinity and perfection of it all…but sometimes it’s just plain confusing, impossible to make any sense of it. So I do my best to surrender, but what about conscious free will? What about being firm and decisive, continuing to move forward even when the path is so unclear? What is the balance between “letting go and letting God” and actively engaging in this play? Is there even any difference? Maybe free will is just an illusion anyway because everything is actually God’s Will? But perhaps we must pretend to have free will so that we stay strong and actively engaged? Maybe I should stop thinking about all of this so much and just LIVE and EXPERIENCE life, focusing more on staying in motion, rather than continually seeking to understand it all? Upon hearing Ray LaMontagne speak these words (quote above) in a video of his song, “Hold You in My Arms,” I had this realization that having just “met” the other hemisphere, there is a wholeness that is being realized inside of me. It will take some time to integrate, but I feel like I am really beginning a brand new life now, post-India…this wholeness will inform me and be expressed through me in every way, especially through my music…SO exciting!!! I’m still navigating this last bit of the journey here in India, still dealing with some challenges…but I’m feeling really grateful for all the blessings and intense purification that I have received here…and I’m also feeling REALLY excited to see what the next chapter holds in store for me…and for ALL of us as we move deeper into 2013!!! So we must keep moving forward, forward, forward, trusting the process and knowing in our hearts that all is always, always WELL, that we are loved and cared for in every moment, and that the perfection of God is all that exists, now and forever. Amen. I am sitting in a car that is parked alongside the road. The driver got out of the car to do something and doesn’t speak English well enough to communicate to me what is going on. It’s a busy time here in Allahabad with a hundred million pilgrims from around the world coming and going from this sacred city, so the roads are packed with cars, rickshaws, buses, pedestrians, cows, dogs, and so on. I spent last night in a tent so that I could be nearer the Kumbha Mela and to bathe in the Ganges this morning, which was one of the most auspicious bathing days. So I’m waiting here, wondering where he went and when we’ll start moving again so I can get to the hotel where it’s warm and dry, where there is good food and a soft bed. It’s cold and raining tonight, and I have been crying. Emotionally exhausted, I am at the absolute limit of how much I can take and the time has officially come for me to leave India, and soon. As soon as I get back to the hotel I will begin looking at plane tickets to Delhi to retrieve the things I have on storage there, and then to Bangkok because this is where I want to go to sort out all these health issues that I have been having here in India. The time has come to get this straightened out so that I can get back to the U.S. and record my album. I realized that even though I have an opportunity to record here in India, it’s time for me to go back to the States, so I will record there instead. It’s time for deep, deep fulfillment and musical bliss. It’s time for a break in this crazy intense karmic burn. It’s time for the next step and the next chapter. Back at the hotel now, I am reflecting on the car ride here. 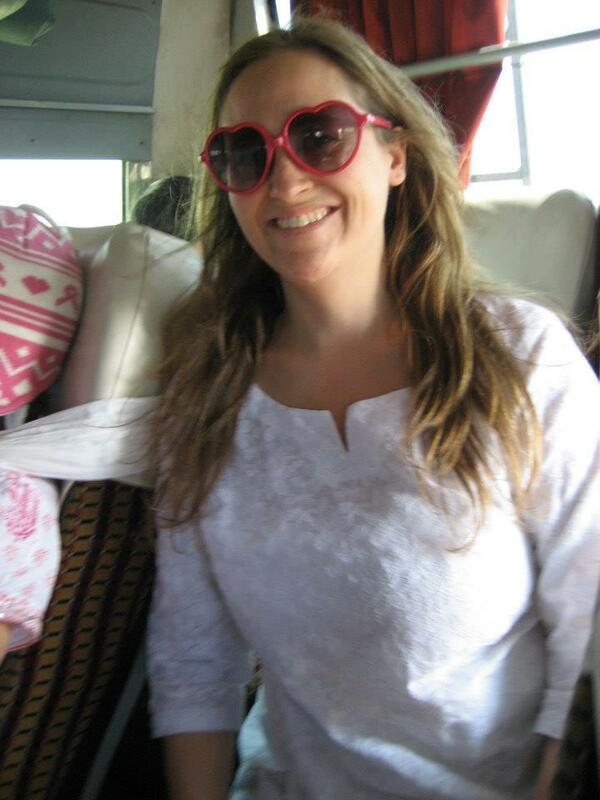 As we were driving from the camp at the Kumbha Mela, through the wild, crowded streets of Allahabad, to the hotel, I was feeling a lot of love for India and very grateful for all that she has given me. And I also strongly felt myself beginning the return journey home. The pilgrimage has ended. Today was a great culmination of this and it is clear to me that I am now complete here. 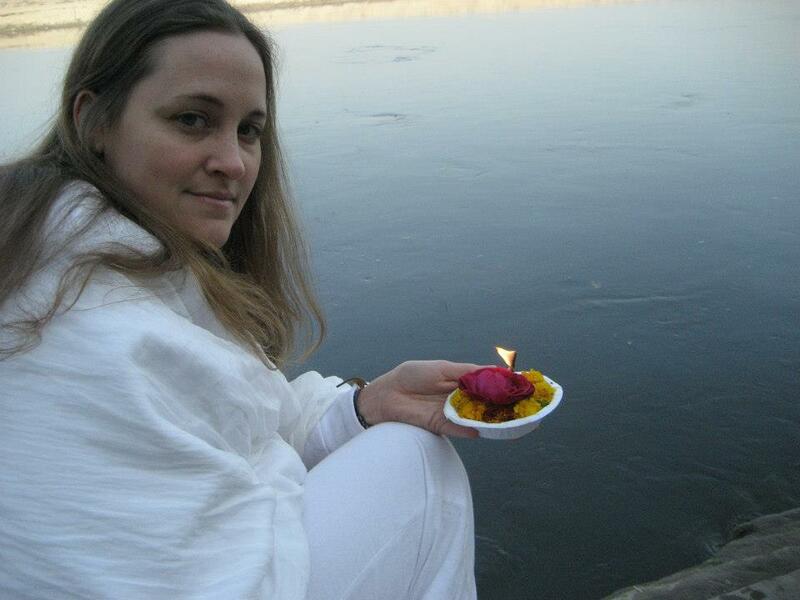 I made it to the Maha Maha Kumbha Mela, which only happens once every 144 years…I bathed in the Sangam (where the Ganges, Yamuna, and Saraswati rivers converge) on one of the most auspicious days possible…I attended the inauguration for the new Maharishi Mahesh Yogi smarak…and for this very special occasion, I wore a sari for the very first time, something that I definitely wanted to do while I was here in India. And with this, along with a million other things that have happened here, I am complete. And now it’s time to go back to the U.S.
First is the question of how I will be able to sort out my health issues. My first step is that I will fly back to Delhi on Sunday. From there, what I really want to do is fly to Bangkok before I fly back to the States. I have heard nothing but the most AMAZING things about the health care and dental care in Bangkok and feel very strongly that the key to my healing lies there. 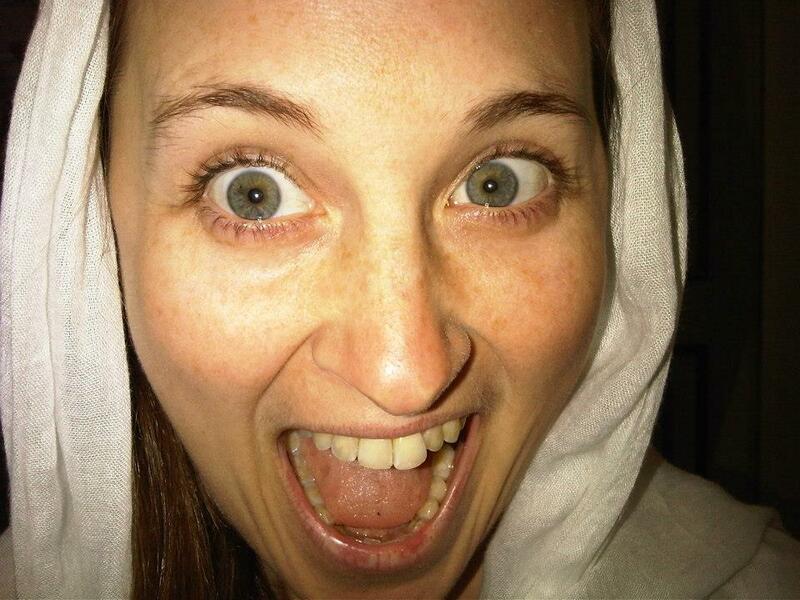 I really need to see a HIGHLY skilled dentist and take care of all these dental issues. And also I must (as soon as possible!) find out what’s going on with this awful rash on my belly. One person looked at it and said “parasite” and another person said “staff infection.” And now I also have a rash on my back and also my nose, so the sooner I can see a doctor, the better. Financially I’m not sure how any of this will be possible, but somehow it WILL. I deserve to receive the healing and care that I need, and so somehow Nature will work this out for me and I will be WELL taken care of. It’s been a long, crazy, wild adventure here in India, but over and over again I reminded myself that India is known as “karma bumi.” It’s the best place on the planet to burn one’s karma most quickly, so this gives a meaningful framework for everything that I have gone through here. After telling my friend Ram about everything I’m going through right now, I asked him, “It’s all part of the purification though, right?” “Yes, of course,” he responded with such sweetness and love. I have SUCH love for the Indian people…their generosity of heart and unwavering optimism and joy have deeply affected me and I pray that one day I will be able to somehow serve this great nation in an extremely meaningful way. The depth of the riches here is truly unfathomable. I was speaking with my friend Asher yesterday at the inauguration and he spoke of this richness so beautifully. “How’s India?” I asked him. “Heaven,” he responded in his beautiful Australian accent. As he said this, his face was lit up with a huge smile and a look of awe and deep reverence, eyes full of bliss as he gazed into the distance. He said that he feels that in every place there are layers, from the most physical/material down to the more and more subtle/spiritual layers. “In all places, there are layers,” he said, palm facing the ground and moving down to illustrate this description. “Here in India, there’s no bottom,” he smiled, face beaming with such deep appreciation and joy. I definitely FEEL the truth in this. I have definitely experienced some of this incredible richness of this magical land, although I have only BEGUN to travel down through the layers that exist here. And I cannot even begin to put into words how all of this has affected me, transformed me, purified and humbled me. Never in my life have I felt more humble….more in awe of this great big huge creation and the stunning contrast that lies within…more amazed and utterly dumbfounded by the immensity of the spectrum of its infinite layers, cycles, patterns, beings, intelligence…and its perfection. All of this can never be captured. It can never be described. We can point our finger toward the Mystery and feel gratitude and awe for the greatness of this opportunity to be a part of it. We can pray for strength, guidance, and purity of heart. We can do spiritual practices that best support and facilitate our growth and evolution. We can get down on our knees and thank the heavens for it all, for every single thing. Even when it’s painful. Even when nothing seems to make sense. Even when we feel lost and all alone in a big, strange universe. As I type these words, tears of gratitude are washing my face because despite all the hardships that I have gone through here, I know that the blessings that I have received are infinitely greater than I can even begin to comprehend. And I am humbled by the vast abundance and generosity of this great universe in which we live and by the infinite wisdom here. If you are reading this, it means that you have helped to make this journey possible for me. And I love you and I am more grateful for you than I could possibly express in words. So all I can say is “THANK YOU SO MUCH!” for being with me on this journey. I will continue to update you as things move along home and as my health is restored to fullness, to a new level of health and vitality even beyond what I have known up until this point. I pray that your journey may be deeply blessed, and that may you fully realize the divinity within you, the love that you ARE. All love and blessings to you. May you always feel loved, held, supported, and cared for in each and every moment. And may God bless you and keep you always. I am sitting at the airport in Delhi, SO happy to be typing these words on my MacBook, which my friend Lisa so generously carried to India with her from the States and delivered to me here in Delhi last night. I’m en route to the Kumbha Mela. And it’s not just the Kumbha Mela this year…it’s the Maha Maha Kumbha Mela, a most auspicious occasion which only takes place every 144 years. I am feeling really blessed and really grateful to be on this pilgrimage, and also somewhat anxious about what awaits me there because it’s a HUGE convergence of human beings and Lord only knows how hectic it might be to be in amongst the masses. Everything is changing every moment, and thank God my laptop is beneath my fingertips so that I can write it down. Write the story. What is the story that’s unfolding here? Going back to November when I saw Amma in Detroit, I can begin to trace this storyline, to discern (to some extent) what is going on here. When I saw Amma at the end of November, I handed her a small white piece of paper. It said, “Dear Mother, please remove all vasanas that are blocking my music and my abundance. Thank you. Love, Erin” The next thing I knew, I was in India. It was literally a whirlwind of Nature support and suddenly I was flying across the world for my first meeting with the Eastern Hemisphere. Since I have been in India these past six weeks I have had some of the most amazingly magical, synchronistic, and blessed spiritual experiences of my life. AND I have been in many extremely challenging situations and experienced a lot of really intense emotions, a lot of crying and feeling lost and afraid, alone in a big, strange universe. A couple of weeks ago, I was at the Neem Karoli Baba ashram in Vrindavan, sitting next to the bed where he used to sit with his devotees. This bed holds SUCH incredible spiritual energy, and at one point I placed my forehead on the bed, directly on the very blanket that he himself had once used, and I could feel the energy move all throughout my body like electricity, blessing every ounce of my being. I sat there meditating, feeling so unbelievably blessed to be in such an amazing energy field, so full of his divine presence. The feeling was one of DEEP, warm, nourishing, fatherly love…extremely playful and full of joy… similar in some ways (I imagine) to how it must have felt to sit in his presence while he was in the body. Suddenly I could see him VERY clearly. I became a clump of wet sand in his hand, and slowly and lovingly he massaged the sand with his fingers, breaking apart the clump so that the pieces of individual sand could lie on the earth and dry. And as this vision was taking place, I could FEEL in my body the experience of what was happening. As he was working on me in this absolutely incredible way, I could feel myself deeply relax…I could feel myself just surrender into the space around me, to feel more at ease than I had felt in a very long time. My perception shifted to become more aligned with Nature, and through all of this I began to taste this amazing and absolutely delicious simplicity. All was well within me and within the universe, and I felt deeply at peace. I asked him for guidance about how to best share my music with the world, and he smiled at me, looking happy and pleased with me…and also there was this sense that yes, I am doing well, always doing my best, following my intuition, and yet there was a possibility for me to step it up in a way, to ignite more of a fire to fuel my musical journey in a more powerful way. Suddenly I was rolled up like a ball and he kicked me like a soccer ball…far, far, faaaar through the air I sailed, feeling the profound blessing of this darshan booster rocket blast of fire and energy that he had given me. “A kick start,” I later wrote in my journey, smiling at the play on words. 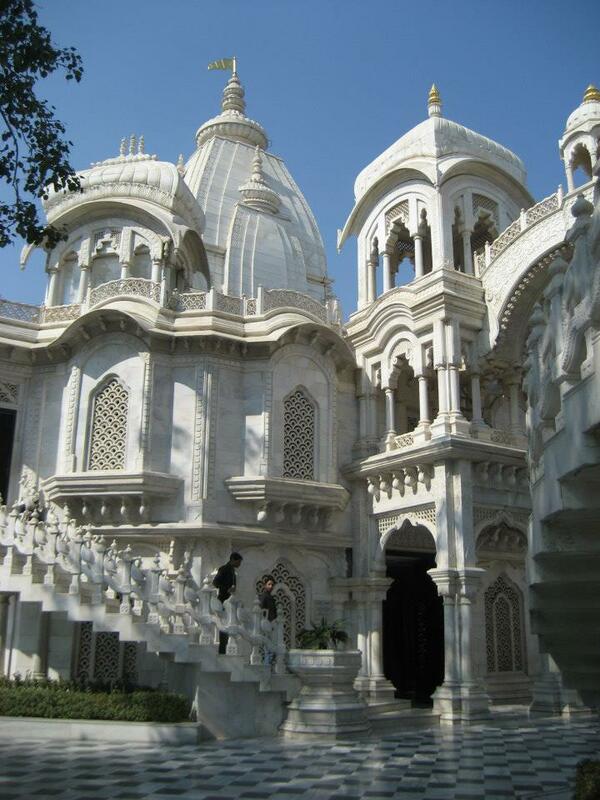 A few days later, I was out walking around Vrindavan and saw a billboard for a luxury housing development called the Hare Krishna Orchid. I felt a strong impulse to check it out, so I followed the arrow on the sign. I walked and walked down this long, curious, dusty road all the way to the end. I decided that I would pretend that I was interested in purchasing a flat there so that I would have some purpose for my visit. I walked through the security gate and into the main office where I sat down at the desk and began speaking with the marketing manager who told me that his name was Raj. He took one look at me and said that he needed to put all business aside for a moment and tell me that I must be very, very careful here in India, that I shouldn’t trust just anyone because there are cheaters here who might not have good intentions. He said that he could tell that I was a very honest person and he was concerned that I might be taken advantage of because I’m so open-hearted and trusting. Raj and I talked for quite awhile, and just before I left I handed him my business card. He was very interested to learn about my Medicine Songs, the healing work that I do with my music, and wanted to schedule a session with me for the following day. So the next day I gave him a session and he really, really enjoyed it. He told me how powerful my voice is and was deeply moved by the experience that he had had while I was singing. He told me that I have goodness and honesty written all over my face, telling me over and over, “You’re a good one!” He also said to me at one point during the conversation, “People like you should be messengers for your country.” He was sharing with me that many people do not think very highly of the United States, so it’s good for people to meet ambassadors like me who can show them that actually there are many good people in the U.S. and thereby help to shift the negative stereotype. All the while, the Russian women who live with him had been cooking dinner and he invited me to stay and eat with them, but I said that I’d rather return another night so that I could bring my friend Daniel with me to meet everyone, which we did the very next night. So, like this, Daniel and I have become quite close with Raj and he has taken quite an interest in helping us to find what we need here in India. Daniel, having recently decided to stay in India rather than return to the U.S. as he had planned to do, is looking for a music teacher. And I am looking for a recording studio and musicians to work with. For the past year or more, I have felt really, really ready to just get in the studio and record. Because of the very unique nature of my particular creative process (unlimited spontaneous improvisational devotional singing), it has taken me awhile to discern how I can best share this music with the world. And at this point, I feel most inspired to be in a recording studio and sing and sing and sing and record it and work with a top level producer and engineer to create an album. And maybe some of this spontaneous flow will be turned into more structured songs with choruses and verses, etc, or maybe not. We shall see. I was really excited when I recently learned that actually, the Beatles wrote many of their songs in the studio like this. 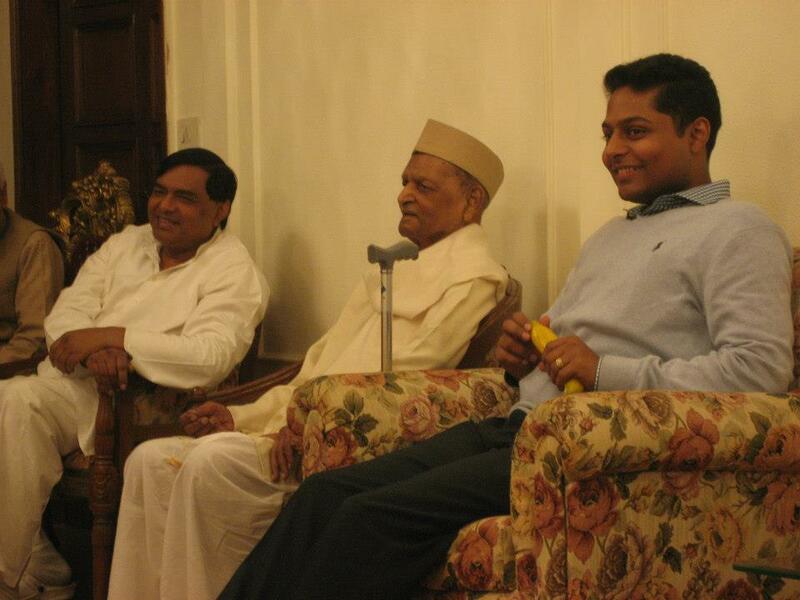 Over the course of a few evenings at Raj’s home for dinner, Daniel and I shared our dreams and goals with him. And he told us again and again that he really feels strongly that we were brought to him so that he can help us to fulfill our dreams and to make sure that we have everything we need while we’re here in India. He said to ask him for anything and everything we need at any point while we are here, even money. “Money is your BEST friend when you are traveling,” he said, a statement which certainly has some truth to it. So clearly something very cosmic and very blessed had begun to unfold, and we were all really enjoying each other’s company and all that we were discovering together. Daniel told Raj that he dreamed of meeting Debu Chaudhuri, one of the most well known and loved musicians alive today in India, and Raj was SO excited to hear this. Raj’s brother (well, really his cousin, but the word cousin and brother are somewhat synonymous here in India at times) Neel is one of Debu Chaudhuri’s main disciples, and so meeting with Debu was absolutely possible, and Raj set about making the arrangements for a meeting with him at his home in Delhi. In the meantime, I had begun to notice that the enamel on some of my front teeth seemed to have literally disappeared overnight, and there were some other concerning things going on with my teeth as well. And so begun an extremely emotional experience of feeling overwhelmed and anxious about what was going on with my teeth, not sure about where to get help, and on and on…and so this was the experience that was running parallel while all of this cosmic alignment of musical connections was also happening. Daniel said he thought it was the bacteria here in India that was harming my teeth, so I began to do what I could to prevent any further damage. I began doing coconut oil pulls every morning and evening, using tea tree oil (which has very strong antibacterial properties), and brushing my teeth after every meal. During this time I also had my first experience playing the “nada vina” which is a more traditional way of saying “tambura.” My friend Rob Cox kept telling me that he REALLY felt like I would love playing it. He has a deep appreciation for the way I sing, allowing my heart to express itself in an uninhibited way, and so he felt like this would be a great way to accompany myself. He learned to sing from Maharishi Mahesh Yogi himself, so to have this validation of the way that I express myself musically was another big blessing on my path. 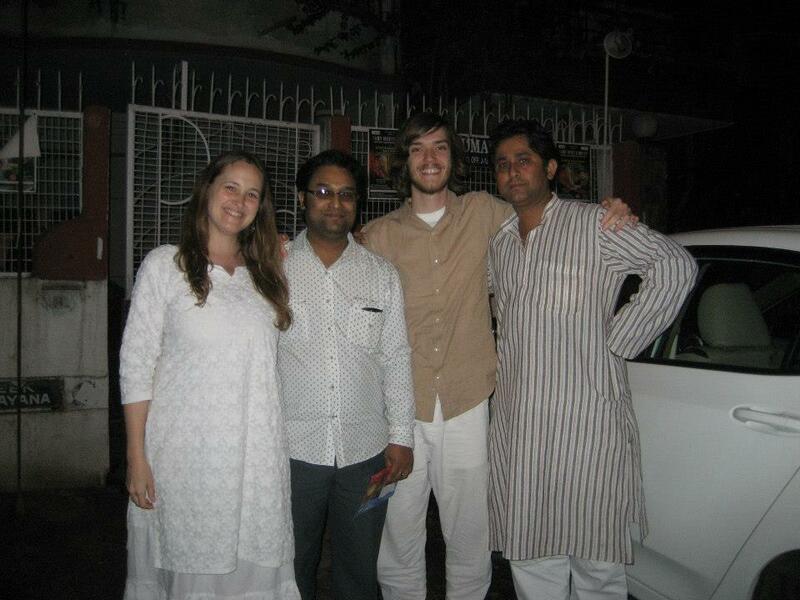 Then the time came for us to travel to Delhi with Raj. He borrowed his friend’s car and hired a driver, and off we went on our first road trip with our new friend. We first stopped at his brother Neel’s place and Daniel and I each told him a bit about what we are looking for musically. I told him about my creative process of spontaneous/intuitive/improvisational singing and of my desire to record an album. He asked me to sing for him, which I did, and he said that he definitely wanted to help me get an album recorded. He said that he has access to a very nice studio, and is also connected with some of the top musicians in India, musicians who play with people like Debu Chaudhuri, etc. He said that I could basically have any instrumentation that I wanted…guitar, bass, any kind of drums, keys, etc, and that he would look into the cost for recording and let me know what he found out. Next, we piled back into the car and traveled to Debu Chaudhuri’s house and had an absolutely amazing meeting with him. I sang for him, and he said that I have a “very good voice.” Daniel sang for him as well and he gave us the contact information for a few people in Calcutta who he said would be able to help us. He said to just tell them that Debu Chaudhuri had sent us to them. Amazing! He asked us quite a few questions and shared his wisdom with us, instructing us, “Be positive and firm about what you want.” We told him that we had come India to be with Amma and he expressed his deep appreciation for her and said that he always goes to see her when she comes to Delhi and has played at some of her programs. And then, after about 45 minutes in his presence, it was dinnertime so time for us to move along. We took some photos, and I touched his feet (as is custom here in India to receive the blessings from a master or guru) before we left. All of this was a HUGE boon on my musical path. 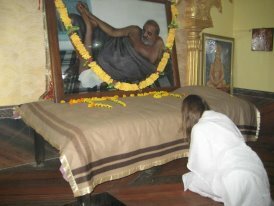 To have the blessings of a master like him is an incredible blessing. He is so masterful and well-respected that he was the recipient of the Padma Bhushan award, one of the highest civilian awards given by the Indian government. When we walked outside, Neel told us that Debu had taken him aside afterwards and instructed him to look after us. Neel also said that usually these kinds of meetings with Debu are much more formal, and that it had been very clear that he had really taken a personal interest in us because some of the questions that he had asked us were quite personal, like when he asked us how we are financing our journey here in India. Then Neel and Raj shared with us a bit more about their heritage and their family history (of which Debu Chaudhuri is a part), which brought even more light to the whole cosmic convergence that was happening. Their family was literally Bengali royalty, kings and queens in the magical land of Bengal, before the British came in and turned everything upside down. And the richness of this royal Bengali family was the CULTURE, the MUSIC, the ARTS…and Raj told us, tears streaming down his face, that he just feels SO deeply blessed to be able to help us right now because he sees that same richness in Daniel and me. It was really QUITE a magical moment in time, standing outside Debu Chauduri’s house in the cool, clear Delhi night air. It all felt SO massively blessed, as if YES, FINALLY my music career is taking flight. This is it!!! I am in the right place and the timing is right and it must REALLY finally be happening for me now!!! The car delivered us to the house where our friend David was waiting for us. 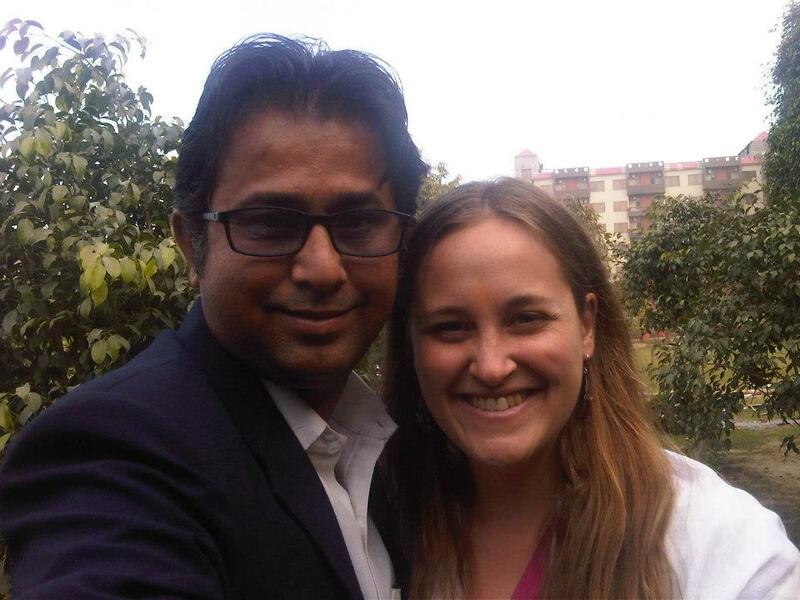 He had just flown to India the day before and the plan was that we’d spend a couple of nights together in Delhi before flying to the Kumbha Mela on February 8th. When we saw David, we recounted the day’s events, the magical tale that we were in AWE to be living, and David was really amazed. He is the one drove us from snowy cold Fairfield to the Moline Airport back on December 29th and has been following our journey quite closely ever since. And he was delighted by this new development in the storyline, also deeply appreciating the blessing of all of this. That night I became extremely ill. My stomach was sick, I had a massive fever, and my whole body ached. On top of this, I was experiencing excruciating pain all throughout my upper back. The pain was so intense that I could hardly move, and I could hardly sleep because one minute I was shivering and the next minute I was sweating. All day the following day I stayed in bed, feeling absolutely awful, and so by evening I decided that I would not be getting on an airplane to the Kumbha Mela the next morning. Daniel, David, and I all left in the same car that next morning. They were headed to the airport and on the way I got into another car which would take me to the Maharishi Ayurveda Hospital to rest and recuperate. In the car, I was telling Daniel that even though everything seemed to be working out for me musically here in India, part of me just wants to go home!!! Home is a relative term for me at this point though because all my possessions are in storage at a friend’s house in Fairfield. And so really the closest thing I have to a home is my mom’s house in Wisconsin, but as much as I love visiting my mom there, I definitely don’t want to live there. But still, part of me wants to go back to the States where I don’t get sick all the time like I do in India, where I can go to a dentist that I know and trust, where I can return to some normalcy of some kind. (The idea of normalcy in my life is really just a fantasy though. I can’t remember the last time my life felt “normal” no matter where I have been.) What I keep saying though is that wherever I am meant to be to be able to REALLY do my music, THAT is where I want to be. I want to do whatever I can to be most fully in service to my music. So I spent a few days at the hospital and went through a pretty rough time there. I discovered a bright red rash on my belly and also some dark brown cavity-looking spots on some of my back molars near the gums and was just absolutely SO overwhelmed and feeling SO confused about what to do. I started asking around to find out if anyone knew of a REALLY good dentist in Delhi, and I was just hearing all kinds of horror stories, which sent me further into overwhelm. I felt like I couldn’t hear my inner guidance (Amma) at ALL, and was just crying and crying and crying so much, feeling absolutely confused and LOST. I was wondering if Nature was trying to show me that I am on the wrong track, that I am doing something wrong, and so experiencing all this disharmony. Maybe it was time to leave India and return to the States. Or maybe this is just all purification, karma burning, etc, something to go THROUGH, rather than a sign that I needed to leave India. One day, after a couple of days of this, I took a long walk, singing the words “Turn this sorrow into love,” over and over and over again at the top of my lungs. My voice was doing some amazing things that I have never heard it do before and it felt quite liberating not to be concerned about what anyone thought of me right then. I needed to SING, and so I was SINGING. And afterwards I definitely noticed that something had shifted, although I still felt pretty sad and unsure about what to do. The next day I took another walk, this time singing, “Mother help me surrender to your love,” over and over. And then I walked to this lovely park full of gorgeous green life next to the hospital, intentionally circumambulating it three times, praying and praying for guidance from Amma. And finally some clarity began to come. I was even getting some guidance about my actual itinerary! It seemed pretty clear that she was telling me that I’ll be leaving India on March 15th, arriving back in the States on March 17th. It seemed clear that I was to go to the Kumbha Mela, then Rishikesh, then back to Delhi, then to Bangkok from February 25th to March 4th to get my dental situation sorted out, then back to Delhi to record my album, and then back to the States. It seems like some really amazing structure is going to be created for me when I’m back in the States (probably in L.A. and maybe doing some work related to the music industry) so that I have a way to earn a good living, support myself, have my own space, etc. And I felt so happy and grateful for the clarity. The next day, I saw Dr. Raju. He is one of the most well respected and adored Ayurvedic physicians in all the world, and I have heard miracle story after miracle story from people who he has helped through the years. I told him about everything that was going on….my digestion was not doing well, I had a rash around my belly button, my teeth were really suffering, and I was feeling lost and confused. He felt my pulse and said that everything I am experiencing is because I am having digestive problems. He prescribed some herbs for me and said that even after seven days of taking the herbs, I will feel a huge difference, and that even my teeth can heal by following this protocol. That night, I sat down to meditate and immediately had this VERY strong vision of Amma. I saw her plop down on the bed right in front of me, quite casually, as if she were my sister or best friend or something. And she was REALLY light-hearted and giggly and happy and just GLOWING with happiness. The message was really clear that she was quite pleased with me. She had put me through this really tough experience and was pleased that throughout it all, I had never stopped crying out to her for help…I had continued and continued to reach out to her for guidance, even when I couldn’t hear anything from her for days. And the sense was that she created this entire experience in order to strengthen my trust, to deepen my faith in her, to cultivate even more divine longing in me, and to remind me in a clear way that she is ALWAYS with me, even when I can’t hear her. She told me that I am to trust Dr. Raju, take the herbs, and she is going to protect my teeth until I can get to Bangkok for treatment in a couple of weeks. I know this story is crazy long and if you have stuck with me this long, wow, thank you…this is just pouring out of me, so this story must want to be shared. So then YESTERDAY was a really blessed day and everything was really flowing and coming together for me. I was feeling extremely clear and it just seemed like I was living one big huge long miracle all day. I woke up to a few different emails with contact info for dental clinics in Bangkok, and when I shared this with the guy sitting at the computer next to me, he handed me a card from a clinic in Bangkok where he has had really good experiences. I bought a new plane ticket to the Kumbha Mela and the arrangements for accommodation fell into place and just one thing after another was coming together. I was also emailing back and forth with my friend Yahyah who will be traveling to Thailand at the end of the month to meet his mother for the first time! And our friend Antwan will be with him as well. These are two of my very favorite brothers, two of my very favorite people in the entire universe to sing with. Nature seemed to be organizing everything and it all felt completely effortless. AND, I even got my MacBook delivered to me from the States last night! When I spoke with Daniel (who was in Varanasi) last night I told him about everything that had happened and he thought it all sounded really great. He gently asked, “Is the money there yet?” and I laughed a little and responded, “No, not yet.” “That’s okay, that’s okay,” he reassured me. “The money is coming.” We were still planning to meet up at the Kumbha Mela and to travel to Rishikesh with David as planned. Then I called Daniel TODAY from the airport just before I boarded this plane that I am currently on, flying to Allahabad, and he told me that there has actually been ANOTHER new development in the plan. He has decided that actually (instead of going to Rishikesh) he needs to go to BANGKOK on the 16th to be with our friend Anaghan who is traveling there soon to have heart surgery. So we are canceling our flights to Rishikesh, and that’s what he’s doing, and now I’m again unsure about what I’m doing. Good LORD, what is going ON here??? Why is everything always changing SO much all the time and why does there seem to be SO little clarity? Am I just burning SO much karma right now and that’s why I’m experiencing everything that I’m experiencing right now, or WHAT? So even though that threw me off again, and I’m still a bit thrown off, I’m feeling okay. Because what else can I do but trust that Nature knows EXACTLY what she’s doing? What else can I do but just keep flowing with everything that’s happening right now? The plane just landed on the runway in Allahabad, quite a ROUGH landing, actually (perhaps symbolic of something), and now we’re taxiing toward the airport. So I am wondering many things at this juncture. Am I to travel with Daniel to Bangkok on the 16th? And if so, how will I pay for the plane ticket, the accommodations, and the dental treatment that I need? With all these ever-changing plans, how will I even know when I can safely book my return flight to the States? Am I going to record some music here in India, or will that have to wait until sometime after returning to the States? It’s time to get off the plane, so I will end with a short, simple prayer, and will update you when I can as more becomes clear. Thank you for your continual love and prayers. They truly mean the WORLD to me. Please God, show me the way. Guide my path. Light the way. I love you and I want to serve you in every way I can. Please show me how. To be able to say “THANK YOU” for everything? How can I surrender my life to GOD? As only God can love me. 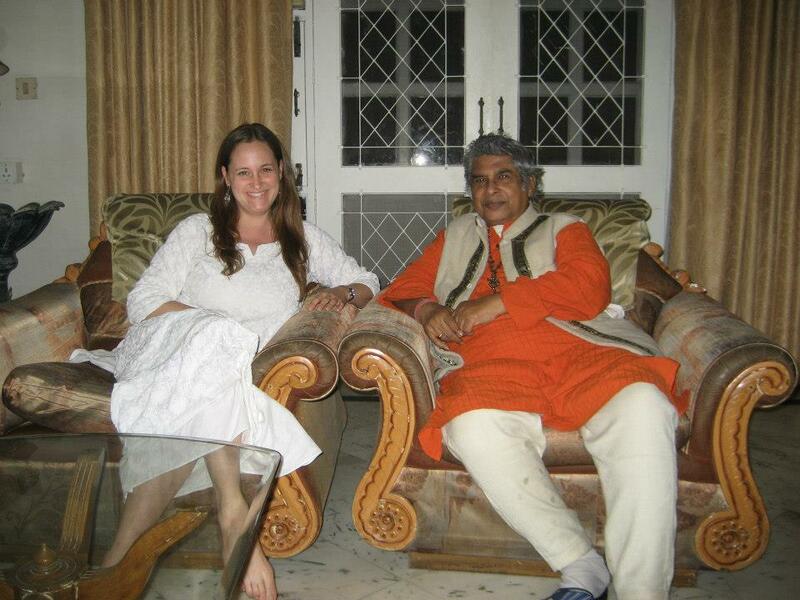 The other day I gifted my friend Raj here in Vrindavan with a Medicine Song healing session. 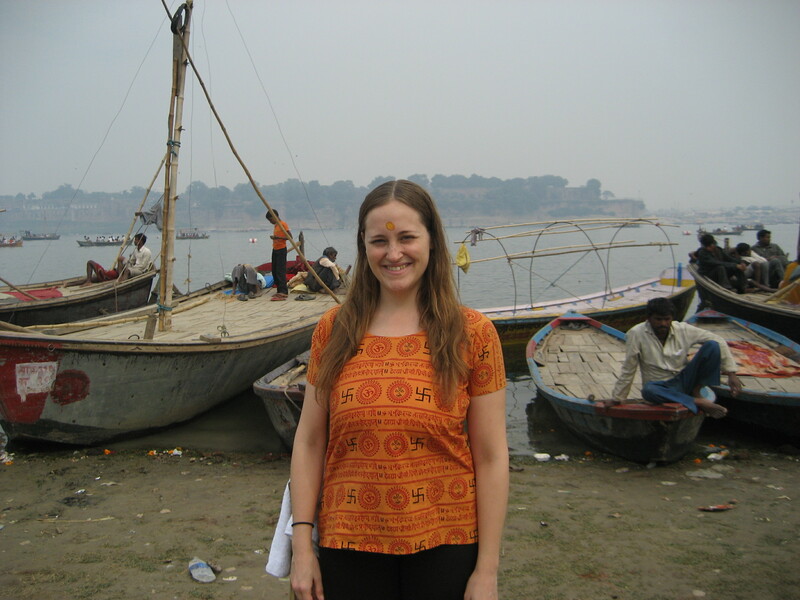 It brought SO much JOY to my heart to be able to do my WORK here in India!!! After our session, the adorable little Russian baby who lives with Raj came over to say hello and enjoy the blissful vibrations. This journey began with an intention to spend time with Amma at her ashram in Kerala. In early December, my friend Daniel (with whom I am traveling) and I received news that Amma had requested that as many as her devotees as possible be at her ashram as we moved into 2013. We both knew in our hearts that we were being called and bought our plane tickets as soon as we could. 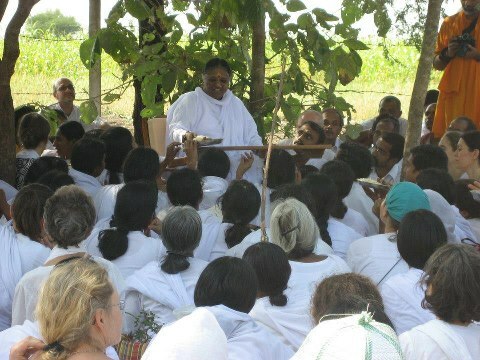 A few days later, we found out that Amma’s North India tour was scheduled to leave the day after we arrived at the ashram. So it became clear that actually we were going to India to go on tour with Amma, which I admitted to myself with a bit of hesitancy because the tours are well known to be INCREDIBLY challenging on ALL levels. I remember reading one of Amma’s biographies, “Amma: Healing the Heart of the World” by Judith Cornell in which the author describes the tour and how everyone was getting sick and how intense it was and just the extreme austerity and massive karmic burn of the whole thing. THEN we found out that Amma had combined her North and South India tours into one, and so it was looking like we’d be on tour with her for seven weeks. I informed loved ones, had a bon voyage party in Fairfield, traveled to Arizona to see my dad, and traveled to Wisconsin to see my mom, brother, aunt, uncle, and cousins. I raised funds to pay for my passport, visa, and plane tickets. It was an amazing and miraculous time…truly, all the wind in the Universe was at my back, and I was in complete awe and amazement at what was happening…by the Divine Mother’s grace, I going to INDIA!!! We began our pilgrimage with an epic two day journey. We left Fairfield at 3:30 am on December 29th. Our friend David drove us from Fairfield to the airport in Moline, Illinois…then we flew to JFK in New York City where we waited nine hours for our next flight to Saudi Arabia…in Saudi Arabia we had two layovers, one was eight hours long and one was just one hour long. 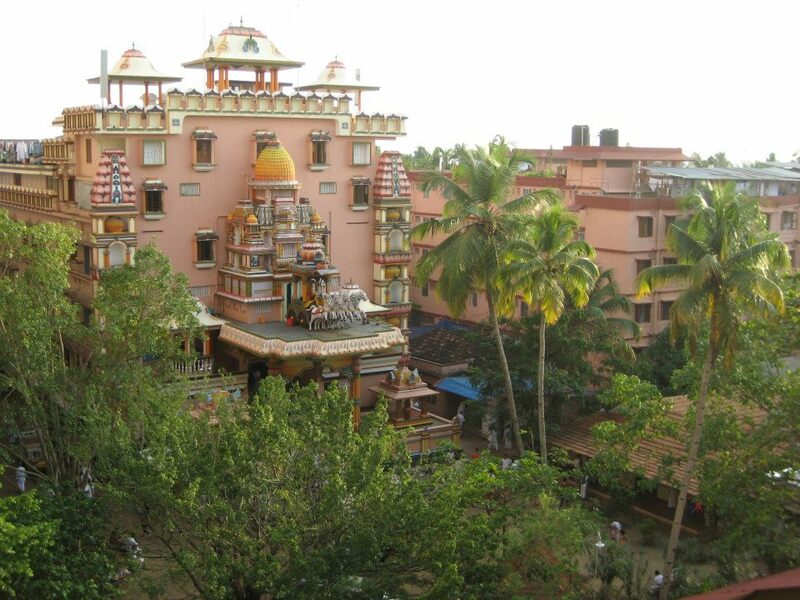 THEN we flew to Cochin, India, and took a 3 1/2 hour cab ride from the airport to Amritapuri, Amma’s ashram in Kollom, Kerala. We arrived there on New Years Eve at 5 pm and had just enough time to drop our bags at our friend Anaghan’s flat and then head to the main hall…we walked in just as Amma did…amazing, divine timing. That evening, we were so blessed to receive darshan (hugs) from Amma…only the people who had arrived that day received darshan, so we were really lucky because there were thousands of people there and just a few were able to hug her that evening…and after she hugged me I asked her, “Mother, tour?” “Okay!” she responded with a huge joyful smile, head wobbling (which I had never seen her do because I had never seen her in INDIA before!) I then walked over to where my friend Anaghan was standing and told him what Mother had said, and that now I just had to figure out how I was going to pay for it because I had just found out that afternoon that we had to pay for the tour in cash. His friend Danny who was standing next to him said, “You can pay with a US check!” So just like that, the deal was sealed. I was going on tour. The next day we ran around the ashram a million miles an hour all day collecting everything we needed for the tour. Her devotees are to wear only white when on tour, so we stocked up on white attire, mosquito nets, toilet paper, and a million other little things that we would need. That night we left at 3:30 am. We headed to our first stop, Bangalore, where we slept for a few hours in one of Amma’s schools and then continued to our first destination, Pune, where Amma held two full days of public programs. We spent about 35 hours or more in the buses those two days, so already by the time we arrived we were already pretty exhausted. And that’s how the tour unfolded….packing and unpacking over and over…spending countless hours in the buses…stopping every so often so people could eat, use the restroom, etc…travelling in a HUGE caravan with about 700 people in all that consisted of 11 buses, a couple of trucks filled with Amma’s ayurvedic products, an ambulance from Amma’s hospital, and Amma’s camper. Below is a photo of me on the bus. 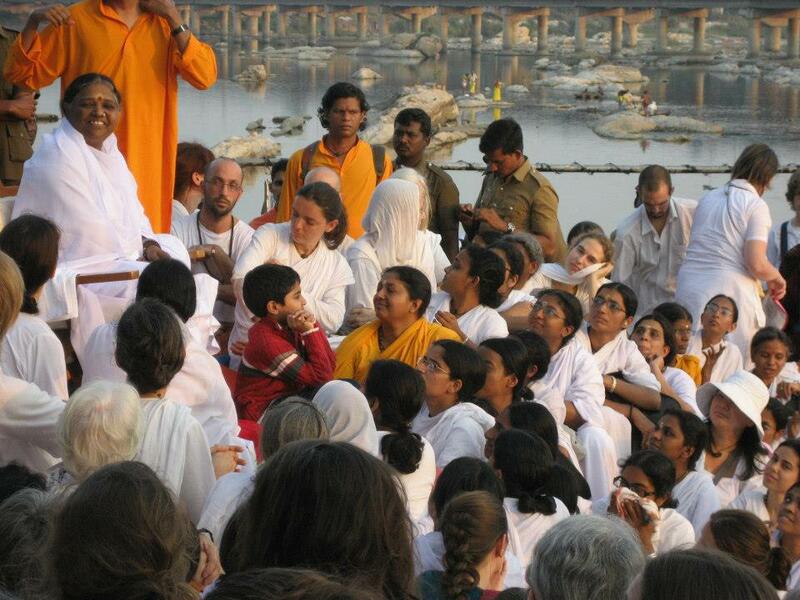 There were some incredibly beautiful moments, like when we stopped alongside the Bhavani River and Amma gave a discourse and we all sang bhajans together. 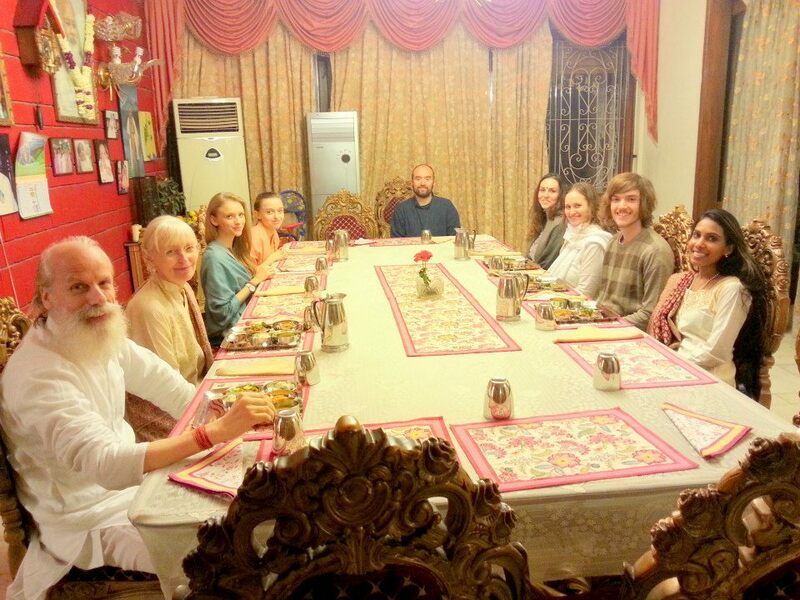 And another amazing moment on the tour was when we stopped for lunch one day and Amma fed us all. Each plate of food was passed through her hands before being passed to us as sacred prasad. How incredibly BLESSED we were to be fed by the Divine Mother herself! The roads are SO bumpy here in India, and many times we would only be able to go 35 miles an hour or so…and we had to stop quite often to keep all of the vehicles together. At night we would sleep on the floor in the classrooms of some of Amma’s schools. One night I looked around and estimated that there were probably about 200 women sleeping in this one large room! We attended two full program days in Pune and two full program days in Mumbai and the entire experience was austere beyond austere. So without going into any more details, I will just say that in the process of travelling over 2,000 miles in this way, Daniel and I both became ill.
By the time we got to Delhi, neither of us were feeling well enough to continue on the tour, so we stayed for a week at the amazing Maharishi Ayurveda Hospital to rest and heal. Nature made it exceedingly clear that this was what we were to do. 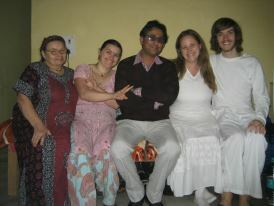 I first visited the hospital on Maharishi’s birthday (photo below of Ram, Julia, Veda, and me). The next day I again returned to the hospital (which I would describe more as an Ayurvedic clinic than a hospital) to receive some Ayurvedic treatments, hoping that I would be able to rejuvenate myself enough to continue on the tour…the next tour stop was Calcutta and I fully intended to be ready to go by the time the buses were to leave the following day. The next day came and I was upstairs in the computer room checking my Facebook when I received a Facebook chat message from David, a friend in Fairfield. He told me that Daniel was very sick, and wondered if I knew. 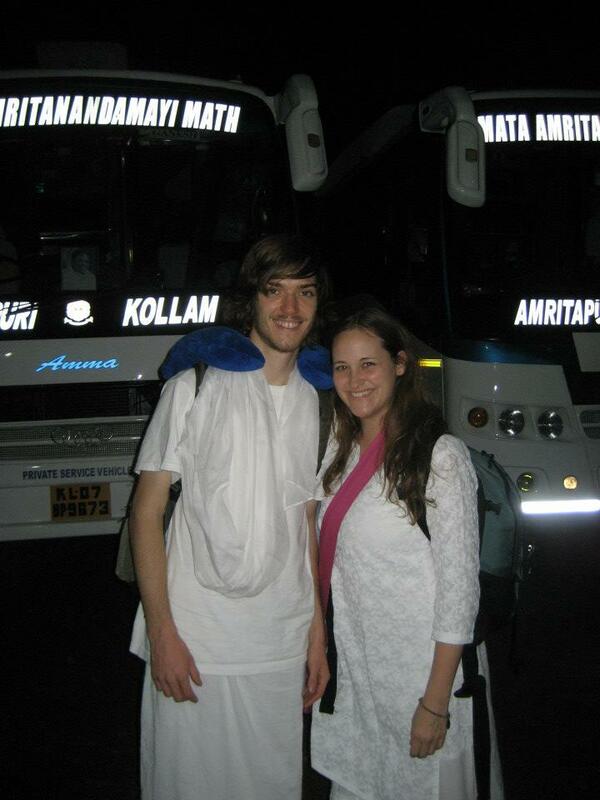 He continued, letting me know that Daniel was at the Maharishi Ayurveda Hospital! I responded, in absolute AMAZEMENT, “I am at the Maharishi Ayurveda Hospital!! !” If not for this, I would not have known that he was there! I immediately went down to the desk and asked for Daniel’s room number. I knocked on his door, announcing myself… “Erin!! !” He opened the door in absolute amazement. I didn’t have a cell phone at this point, so he was really concerned that he had left for the hospital without being able to tell me that he was leaving. But Nature had organized it PERFECTLY, and there we both were. We realized that we both needed to stay in Delhi and rest and heal. So that evening we gathered our belongings from the school we had been staying at with the others on the tour, and informed the man in charge of the tour that we were staying in Delhi and that we may or may not be returning to the tour. That night we enjoyed an amazing dinner at Ram’s house and were so blessed to meet his beautiful family. 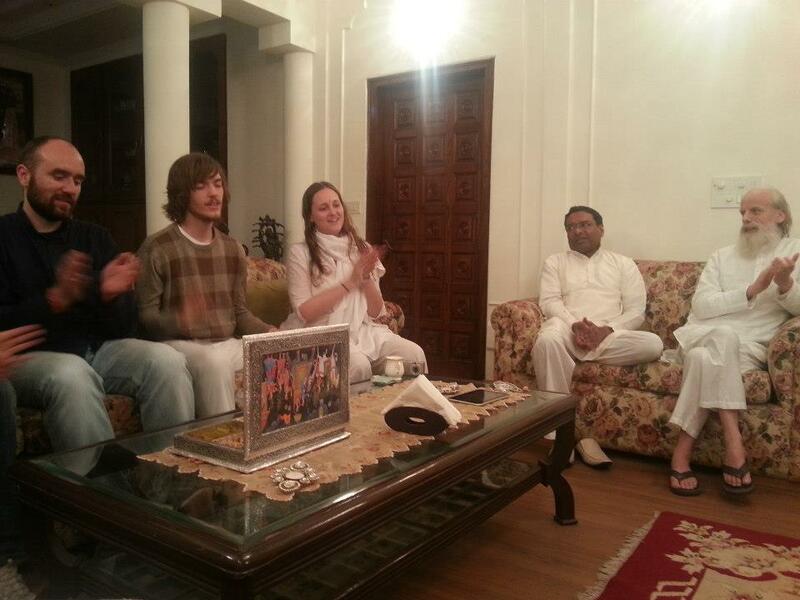 After dinner, in the sitting room, Ram invited a few people (including me) to sing for everyone. And just then, someone went upstairs to bring Maharishi’s 103-year-old brother down to the sitting room to enjoy the music. So I got to sing for the entire family, including Maharishi’s brother! He is in the middle in the photo below. Ram is on the right. We then spent a week enjoying DELICIOUS food, wonderful accomodations, and amazing company. We were delighted to discover that our friends Veda and Julia were ALSO there, so we got to spend some time with them, and also with the Lucas Family who we met and came to love during our stay there. 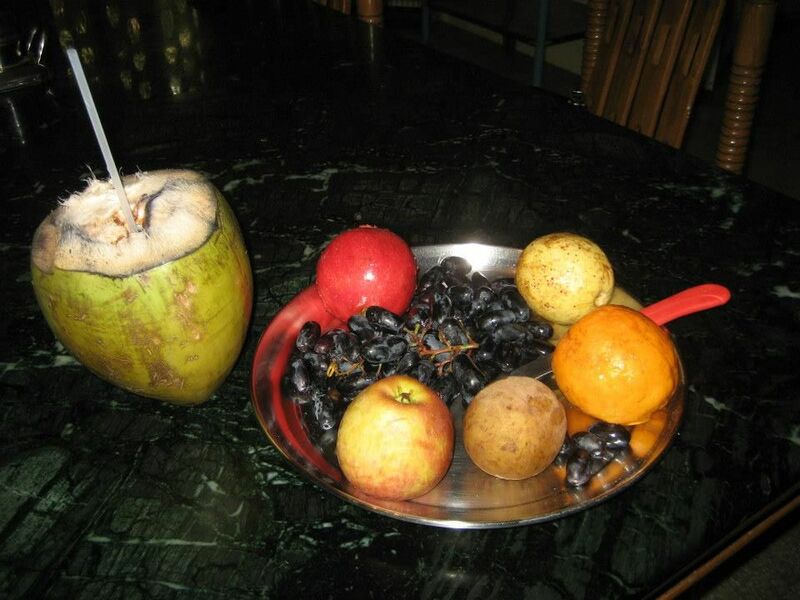 I was so, so grateful to eat such delicious food (including an abundance of incredible fresh fruit) and have fresh coconut water delivered to my room each morning. 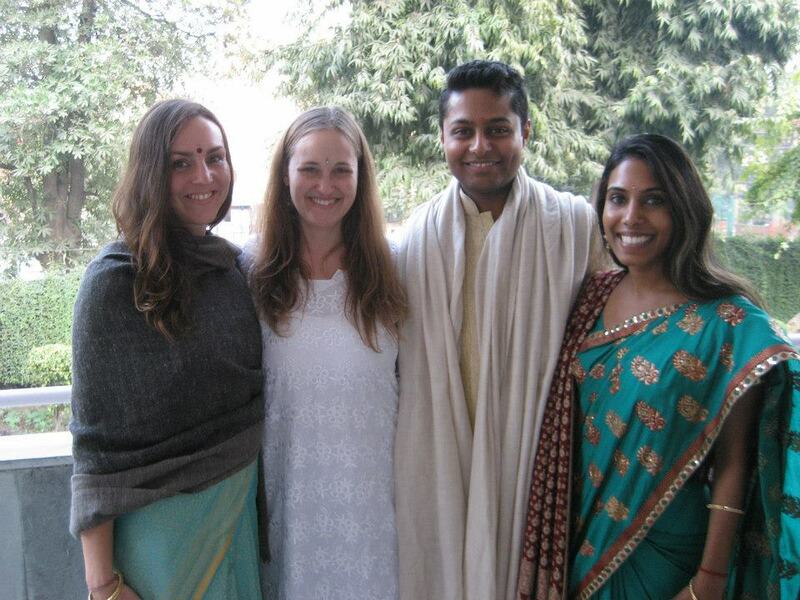 I was also so grateful for the amazing staff who took EXCELLENT care of us, laundry services, hot showers, and some of the best Ayurvedic doctors in the world reading my pulse every day and teaching me about Ayurveda. The entire experience was just SUCH an incredible blessing. After a week in Delhi, I was feeling much, much better, and it was time to continue on with the journey. 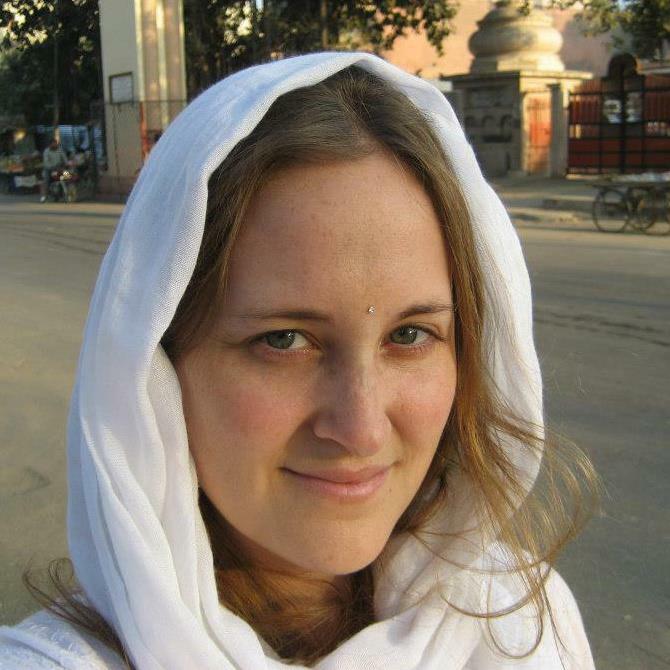 Daniel, Julia, and I decided to travel together to Vrindavan, the childhood home of Lord Krishna, kirtan, and bhakti yoga. It’s been a wonderful experience visiting many sacred sites in this area…especially the Maha Samadhi Murthi of Neem Karoli Baba. And it has also been wonderful soaking in the gorgeous devotional music in the Sri Sri Krishna Balarama Temple here. 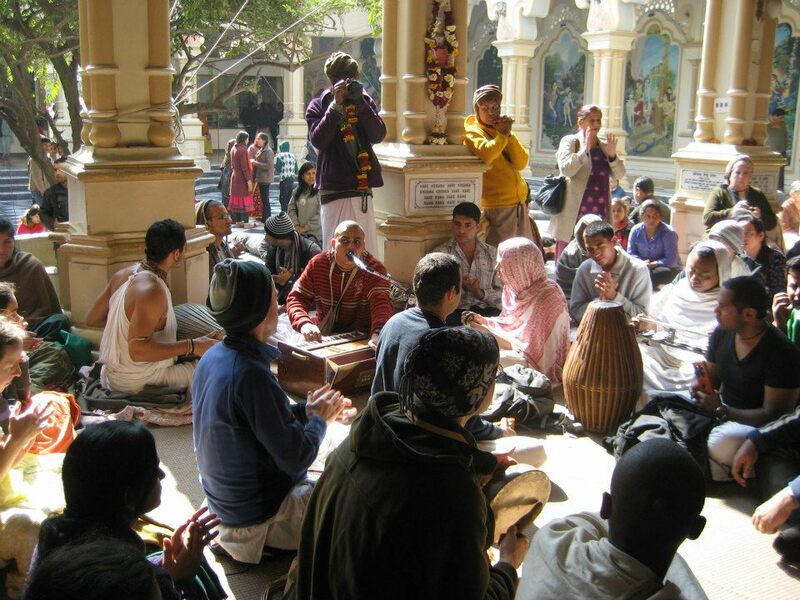 During my time here in Vrindavan I have learned SO MUCH about the true meaning of bhakti (love, devotion, and surrender to God) and have experienced so much incredible sacred music that accompanies this bhakti here in Vrindavan. Next we will head to the Maha Maha Kumbha Mela in Allahabad, and after the Mela, much is still waiting to be discovered. It is not yet clear to me how long I will stay here in India, but I know that I will continue to be divinely guided every step of the way. And as this pilgrimage continues, my intentions are strong and clear. I am here to purify my heart so that I may be a clear and present channel of God’s grace. In this way, by God’s grace, the music and abundance that I am here to share will be able to flow through me in their purity, blessing the world with Love in many forms. This pilgrimage has continues to be so full of miracles and blessings, some blissful and some quite challenging. And for all of this I say THANK YOU. This journey has been so mind-blowingly transformational on so many levels, way, way, WAY beyond my comprehension.